At least 168 people have been killed and over 745 injured after a tsunami hit the coast on Indonesia's Sunda Strait, reported BBC citing senior government officials. The possible cause of the tsunami was undersea landslides after a volcano erupted. The country's disaster management agency said hundreds of buildings were damaged by the tsunami. The disaster management agency warned that the death toll after the tsunami, that struck at about 21:30 local time (14:30GMT) on Saturday, is likely to rise further, said the report. In a Twitter post, President Joko Widodo expressed his “deep sorrow” for the tsunami victims and said he had ordered the relevant government agencies to respond to the emergency. Videos from the regency of Pandeglang in Java’s Banten Province showed extensive damage, and officials said the road from Pandeglang to the nearby regency of Serang had been cut off. Over 400 buildings have been destroyed as waves slammed into the Sunda Strait, which separates Indonesia’s two largest islands, Java and Sumatra, reported The Washington Post.. Beaches in the strait were reported heavily hit in places such as the Pandeglang regency, where 33 were reportedly killed, or several beaches like Anyer or the Tanjung Lesung. Oystein Lund Andersen, a Norwegian witness who was on a family trip on the coast of the Anyer beach, wrote on Facebook that he was on a family trip when he saw the incoming wave. “Next wave entered the hotel area where I was staying and downed cars on the road behind it. Managed to evacuate with my family to higher ground through forest paths and villages, where we are taken care of by the locals. Were unharmed, thankfully,” he wrote. Government officials are warning tourists against visiting the beaches near the Sunda Strait. 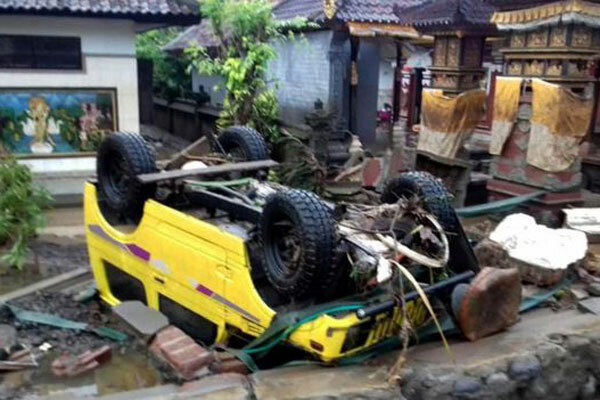 “The national disaster agency and the geology agency are still investigating [the tsunami],” Nugroho said. Nugroho also added that heavy equipment and emergency soup kitchens have been prepared. Indonesia’s volcanology and geology disaster mitigation center said there was an eruption of the Krakatoa on Saturday night. Although there was a “300 to 1500 meter” ash cloud reported above the crater’s peak, the center said, it was unclear whether the tsunami was directly caused by the eruption. Indonesia sits on the seismically active “ring of fire” in the Pacific Ocean, he added.